There isn't anything cuter than these kids and their determination and energy. Well, the kids gave it their all today in the Long Jump at Bob Dailey field in Port Alberni.... tomorrow, the over 17s. Results will be published by the Tlu-piich Committee. The nations with athletes competing in this, the 30th anniversary of the Tlu-piich Games, gathered together to show their colors and wave their flags during grand entry onto the field at Bob Dailey stadium in Port Alberni on Aug. 8, 2012. The canoe races opened up the 2012 Tlu-piich Games. Jason Anson of the Ditidaht canoe program ran the races with a team of volunteers. From all observations, the races were a huge success with 70 participants and another 200 spectators lining the shore at Clutesi Haven Marina. Opening day of the 30th anniversary of the Tlu-piich Games began with canoe races, and not only for the very experienced. Even children as young as seven were able to compete in the waters off Clutesi Haven Marina in Port Alberni on Aug. 7. Election Day July 18: "Spoiler Alert"--Shawn Atleo wins! Day One of the Assembly of First Nations was filled with reports from the Tri-Councils (Women's, Youth and Elders), Awards and recognitions, and a candidates forum where delegates could hear from the eight candidates running for the position of national chief. 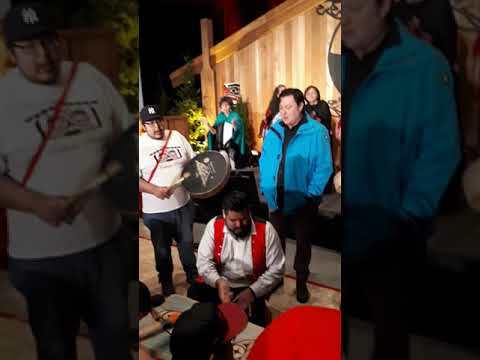 On May 24 at the Chief Joe Mathias Centre on Squamish territory in North Vancouver, Assembly of First Nations National Chief Shawn A-in-chut Atleo launched his campaign for re-election. The vote will take place in Toronto on July 18, a part of the AFN assembly July 17 to 19. On May 23, the new Tseshaht Nation council was sworn into office at the Tseshaht Cultural Centre. Hugh Braker was also chosen as chief councillor.